Norcada’s standard TEM window with a single membrane at the centre of the frame. Norcada’s TEM window array with 9 windows on a single frame for multiple analyses. 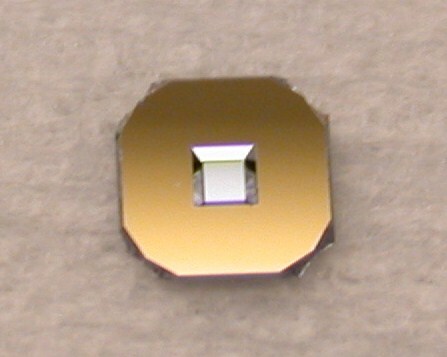 Our standard silicon nitride window grids for Transmission Electron Microscopy (TEM) are available with 5nm, 10nm, 30nm, 50nm, or 100nm thick square membrane windows centered on 200μm thickness silicon frames. The TEM window frames are circular or octagon shaped and fit inside a 3.0mm diameter circle. 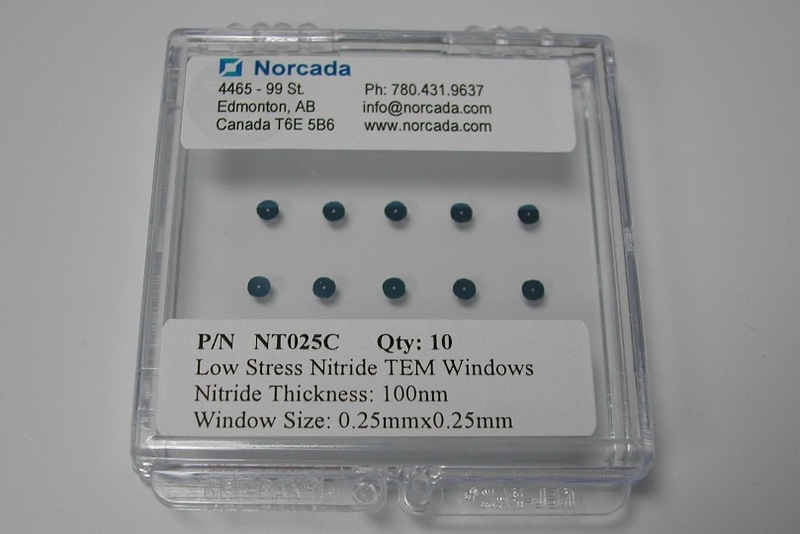 The silicon nitride membrane is low stress and robust. All of our TEM windows are packaged in 2″x2″ gelpaks (10 devices per pack). Location-tagged holey TEM nitride windows are similar to regular TEM grids but with micro-size pores over the membrane area. In addition, it has location markings in both X and Y directions along the edges of the holey membrane, allowing end users to track the locations on the membrane during their TEM work. Click Location Tagged Holey TEM to download product brochure in PDF. 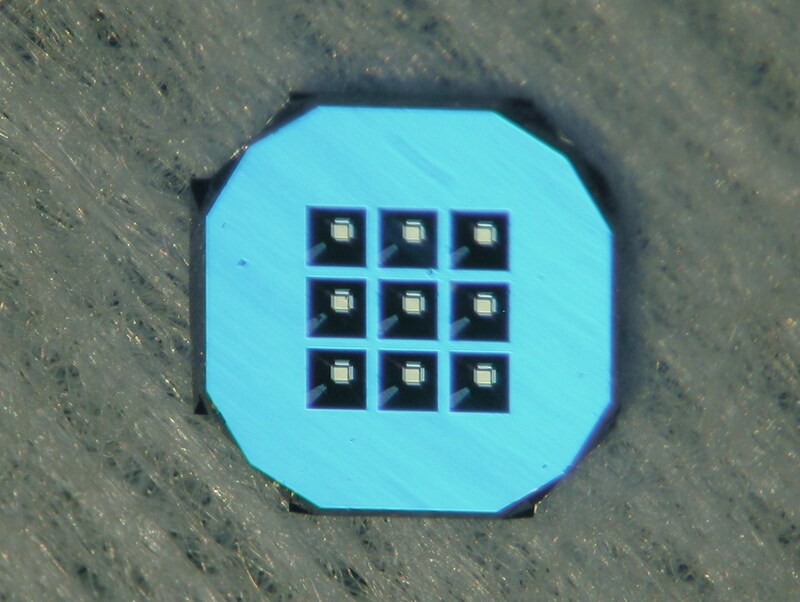 The window array TEM grid has 9 evenly-spaced 0.1×0.1mm square windows (in a 3×3 array pattern) centered on a 200µm thick circular or octagon shaped silicon frame that fits inside a 3mm diameter circle. 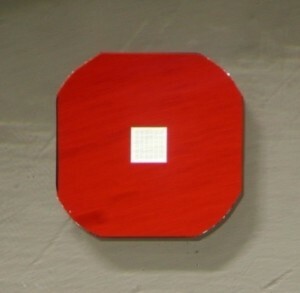 The window array allows the users to carry out several tests on the same TEM window device. The rectangular windows allow much larger viewing angle for TEM work. There are two device configurations available: a single 1.9×0.6mm size window device and a double 1.8×0.1mm size window device. Windows for both devices are centered on the 100µm thickness silicon TEM frame. Click Norcada SLOT TEM to download product brochure in PDF. PLEASE CLICK HERE to order any of the above standard products. The nano and micro porous membranes for TEM come with a range of different pore sizes arrayed on a square lattice with different spacing (pitch) for different designs. The hole array is centered on the square SiNx membrane window, and the window is centered on the frame of the standard TEM grid. More information can be found here. Norcada also provides fabrication of custom designed TEM grids to meet our customer’s specific requirements. Such fabrication services include non-standard sizes, thinner membranes, multi-window arrays, and windows with patterned electrodes, heaters and spacers. Please contact us if you require custom fabrication.